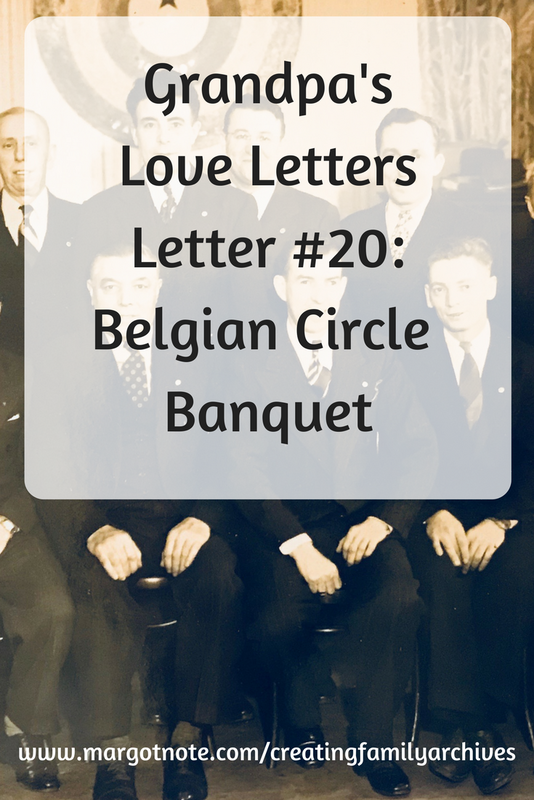 In the 20th letter of the Grandpa's Love Letters series, Grandpa talks about work and mentions his stamp collection. In previous letters, he had written a few notes for Joe, Grandma's stepbrother, who also collected stamps. I had heard growing up that the stamp collection was stolen because I don't remember seeing it in person. Grandpa mentions ten cent commemorative stamps of authors and poets. I was able to find online some examples of that series, which were printed in February 1940. Samuel L. Clemens (Mark Twain) and James Whitcomb Riley were included. The Belgian Circle of Paterson, New Jersey from the 1950s. Grandpa's in the back row, center, next to the guy who looks like Albert Camus. In a previous letter, I mentioned the Belgian Circle. My great-grandfather was on the board, as well as my grandfather. Mostly, it was a social group centered around drinking, according to my uncle. I always feel conflicted about writing about the Belgian Circle of Paterson because of the history of alcoholism and addiction in my family. I imagine many people working with their family history may feel this way too. Addiction can go back for generations, and I am thankful and proud that I've broken the cycle. 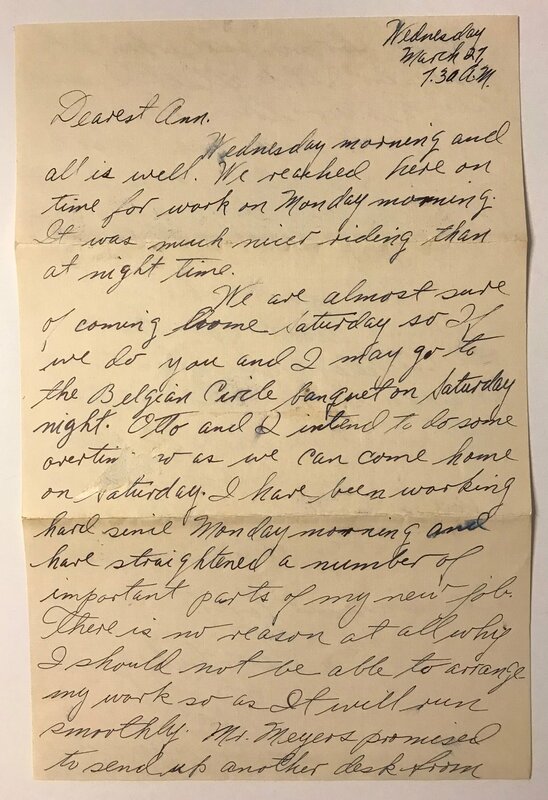 Two things that strike me about this letter: Grandpa seems to be randomly capitalizing the letter "I" and he used his birth name--Rene--for the first time in his letters. He must have been feeling very Belgian at the moment! Wednesday morning and all is well. We reached here on time for work on Monday morning. It was much nicer riding than at night time. We are almost sure of coming home Saturday so If we do you and I may go to the Belgian Circle banquet on Saturday night. Otto and I intend to do some overtime so as we can come home on Saturday. I have been working hard since Monday morning and have straightened a number of important parts of my new job. There is no reason at all why I should not be able to arrange my work so as It will run smoothly. Mr. Meyers promised to send up another desk from Paterson for me and when It comes in I'll be all set. I would like to stay on this job until I get it to run like a clock and then I would not mind at all making another change for the better. Otto just asked me If I dreamt about you last and am telling you about my dream in this letter. He also just told me it has started to snow. I must close now as breakfast will be ready soon. P.S. Tell Joe I have two 10 cent stamps of the new issues of poets and Writers.